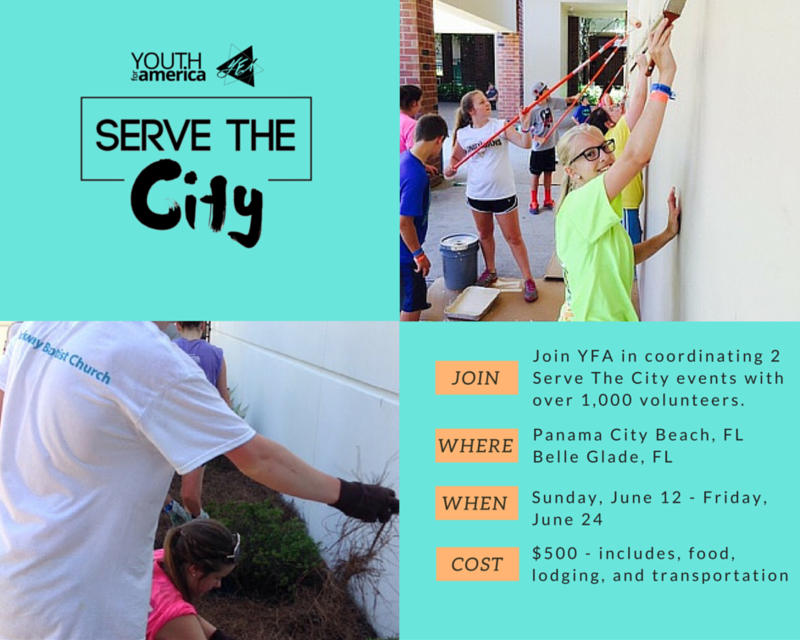 Youth For America will be taking 3 male student leaders with us to our Serve The City events with Xtreme Summer Conference in Panama City Beach, FL and Collaborate in Belle Glade, Florida. It is a great opportunity to coordinate, participate, and help 1,000 students do their Serve The City Projects. Youth For America will be providing leadership training during the trip and helping the students to develop servant leadership skill along the way! transportation to and from Chattanooga, TN. Deposit of $200 to reserve spot. Balance due before departure. It is recommended that each person bring $200 to $250 to buy snacks, fast food lunches, souvenirs, or activities during the trip. Everyone need to be in Chattanooga, TN ready to depart by 9 am on Saturday, June 12. For people arriving on the 11th, overnight housing will be provided. (transportation to and from Chattanooga, TN is the responsibility of the each person). YFA will provide transportation for the entire trip as well as lodging and meals. Each person is responsible for paying for snacks, souvenirs, or extras that they may want to purchase.